With a vibrant estuary comes a vibrant planet all species and people can thrive on. Oysters are a cornerstone species in the estuarine environment. Salt marshes or coastal estuaries are the most biologically diverse ecosystems on Earth. TRUE! They are more diverse than tropical rain forests and they are the foundation of the seafood chain. These ecosystems and the creatures who rely on oysters are under immense pressure from development, pollution and mismanagement. Estuaries are as important to human history, culture, cuisine and industry as any other ecosystem. So, if you love the marshes, bays and oceans...if you love to fish or swim...if you love to eat seafood...if you make a living from tourism in these regions...if you live and breathe on this planet Earth...then these ecosystems are critical to your way of life. And oysters are critical to the survival of these ecosystems. Learn about the programs we offer and the projects we support. Get informed. Start a local chapter. 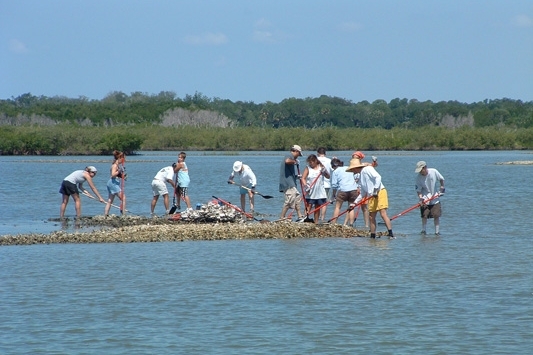 Volunteer for an oyster reef restoration project. Donate.